I see these Regalia pens passing through eBay from time to time. They’re not really uncommon, which implies that they must have sold quite well. They’re clearly of a lesser quality than the pens we usually discuss here, but if you’re interested in pens it pays to be interested in all pens. You never know what you might learn. “The emblems or insignia of royalty, esp. the crown, sceptre and other ornaments used at a coronation. Nothing much of a penly nature there, then, but I suppose it’s no worse than Unique, Kingswood or even Onoto. Because the name sounds a bit like it was ill-translated from another language, I initially suspected it might have been foreign made, but no; both box and barrel insist that it’s an English pen. The second thing that’s a little strange is the price. This is, I should think, a nineteen-twenties pen. By a stretch, and allowing for the most backward-looking of conservative design, it might creep into the thirties, but I doubt it. At that time, 17/6d was a lot of money. In 1928 you could buy a high-in-the-range Conway Stewart 212 with two gold-filled barrel bands for 12/6d (Oh, how I want a time machine!). The Regalia isn’t at the top of any range – everything about it says “cheap pen”. The metal trim has at best a gold-wash. 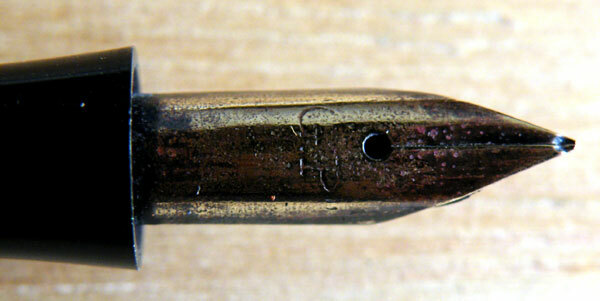 The nib is plated, or once was. The design is two tubes, one large enough to screw onto the other, and the barrel end is threaded. That’s pretty crude. Despite being quite a good idea, the barrel end thread is practically diagnostic of cheap pens. Even by the end of the thirties, 17/6d was still the price of a luxury pen, a cracked-ice Duro-nibbed Conway Stewart 1203, for instance. So I can’t really explain the price, unless maybe you got a small car free when you bought it. So what’s the upside of the Regalia? Actually, it’s a quite competent pen. The spoon-ended nib, though a bit worn, still writes quite well and although it could hardly be described as flexible, I was able to squeeze a little line variation out of it. The black chased hard rubber remains black and the chasing is sharp. The box is gorgeous, very bright and colourful and completely of its time. Both pen and box provide historical documents that fill out the context of the time in which they were made.